I was provided promotional material to share this gluten free dessert recipe but all opinions are 100% my own. 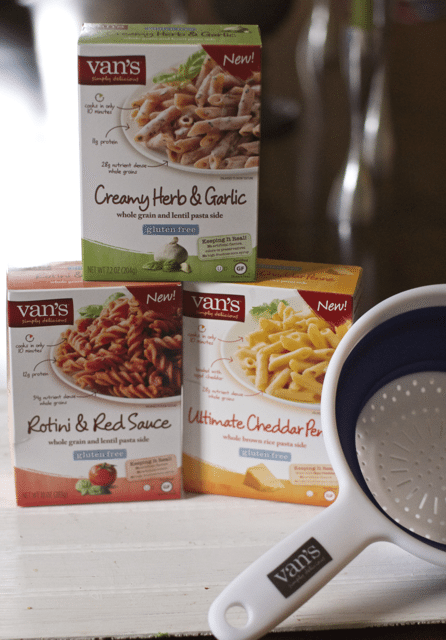 Van’s Simply Delicious line of Gluten-free Products are hitting the markets and there are so many varieties for those who need a gluten-free diet or at least want to reduce the amount of gluten they consume. We were asked to try some of Van’s Gluten Free Granola bites and well as some of their new Whole Grain Pasta boxes. I thought I would try their Gluten-free dessert a Peach and Blueberry Crisp since we already are big fans of crisps. What I like about crisps in general is that you can use frozen fruits so you can enjoy them all year round. We only had frozen blueberries and Raspberries when I made this but be creative that is the best part of fruit crisp recipes. 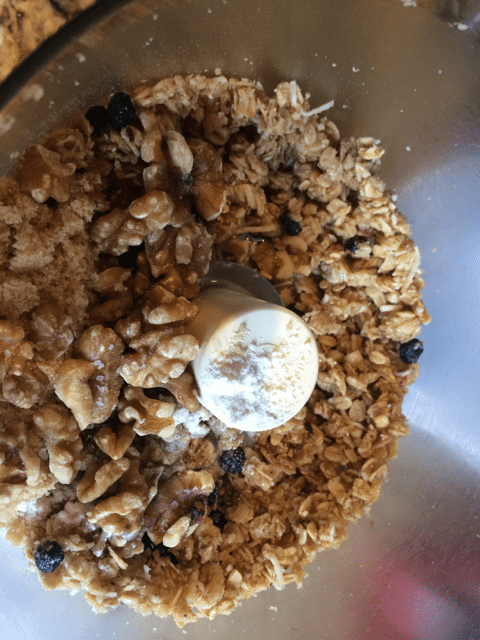 The crisp part does have a lot of ingredients, especially since you are starting with a Granola but well worth the work, especially if a gluten-free dessert is a must have. The Crisp is best made in a food processor I love my Cuisinart but there are less expensive ones on the market. The Soft-Baked Whole Grain Granola Clusters retail for $4.99 and have 12 grams of nutrient dense whole grains per serving. They are more of a large cluster than individual ones, maybe that happened in shipping but I just pulled them apart for eating. 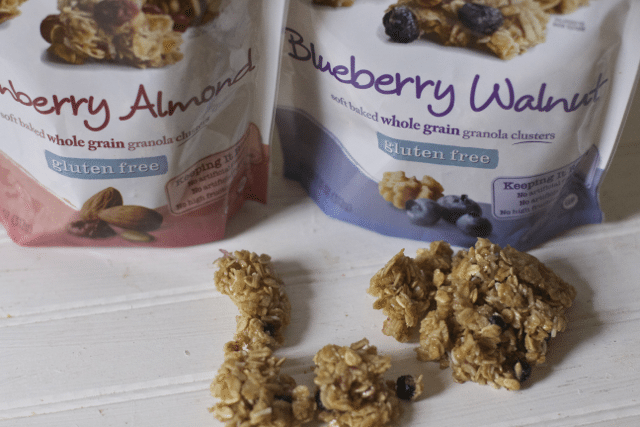 Look at all that goodness added to the already flavorful Gluten-free granola. 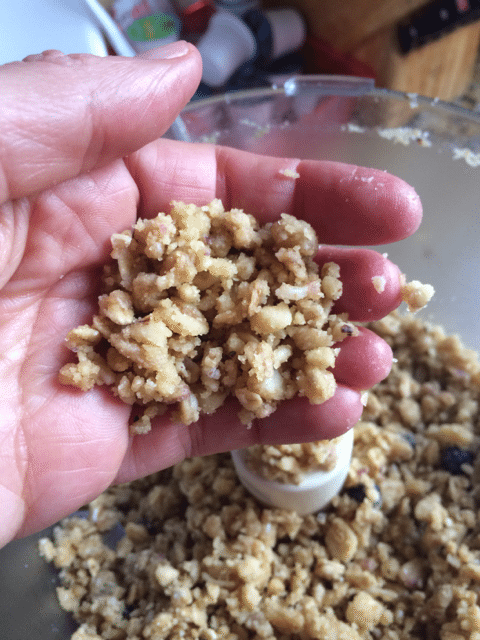 Now give it a whirl in the food processor. 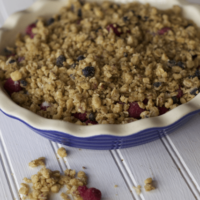 After placing your mixed fruit in your pie dish, let it sit there for a few minutes before adding the topping. Then you can cover it completely with the gluten-free topping and you have yourself a great gluten-free dessert idea. 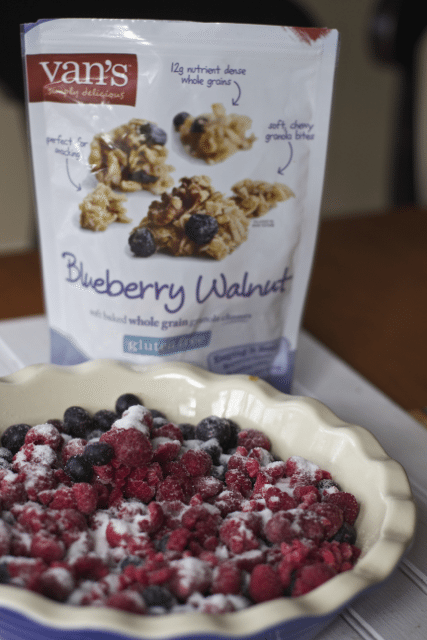 Love the blueberries peaking out from the granola. It was cooked too late so I did not get a photo of the final version,but it was eaten in less than a day. A great and healthy dessert option especially for those trying to eat gluten free. Don’t forget to look out for the gluten free pastas that are new to the market too. I made half this recipe and made it in a pie plate, enough for my family of 5. Preheat oven to 350 degrees. Spray a 9 x13 dish or a 9 inch pie plate if making a 1/2 recipe with cooking spray. 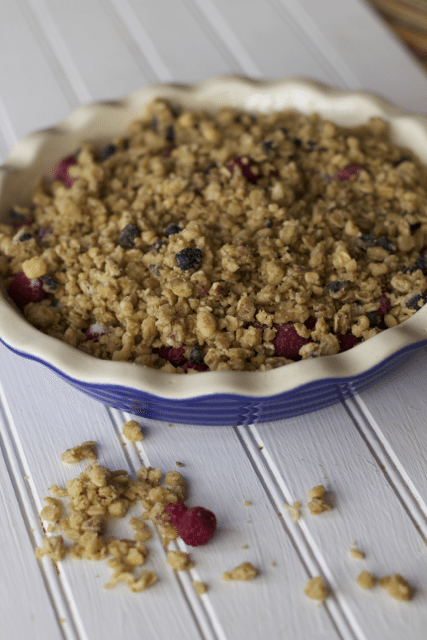 Top fruit with granola mixture and bake for 30-45 minutes depending of size of pan or until fruit is bubbling and top is golden brown. Serve with Ice cream or whipping cream. What is your favorite Gluten Free Desserts? Oh that sounds delicious! I love granola, but haven’t tried Van’s. Definitely going to pick them up next time I see them at the store. What a clever way to use granola! I don’t know if I would have ever thought about using it to make the top of a crisp! This would be a great dessert to bring to a pot luck where I know there are going to be some people who are eating gluten free! My family loves blueberries. I am going to have to make the crisp for them, I am sure they will love it just as much as they do just eating blueberries. 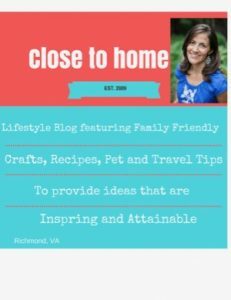 I just found out recently that my 10 year old needs to be eating gluten free food so I’m happy for this recipe. I’ll be giving this a try, I think he’ll love it. I’d like to try that with the cranberry almonds. Very easy snack though, thanks. I didn’t know Vans had all these great new selections. I definitely have to look for them this weekend when I go shopping this weekend. This looks SO good! And I love that it is gluten free so my daughter would be able to have it! I like Van’s products. I did not know they had these in their product line, looks amazing! I’d love to test out this recipe. I really can’t go wrong with granola and fruit! Really another awesome recipe LOL. I wish I had your culinary skills. I love anything that is gluten free. This sounds yummy. It’s amazing how many great products are now gluten-free. Love the GF choices. The fruit crisp looks fantastic. Van’s makes such great gluten free products. They are one of my daughter’s go-to brands! Oh my that fruit crisp looks delicious as does the pasta. I’ll be right over for dinner. Wow the pastas look amazing, as does the clusters. I LOVE food like that.. messy shaped and crunchy. Plus gluten free? Awesome. I’m always looking for new gluten free recipes to try. Thanks sounds like a good one! That sounds truly delicious. I definitley need to make this for myself.